"I will bring back the Dark lord so he can bring justice and order back into this cruel world"
"WHAT?! B-But I killed her! How is she alive?! I struck her with lightning!" Ezekiel ran away from home one day when he was younger and left his parents and his sister back at home. He has practiced magic of various kinds and over the years he became better and better but sadly after a lot of stones thrown in his path to the future and a lot of mocking and hurting he has lost hope in everything...one day he found a book about a dark king that once ruled the shadowrealm with Justice and Order..he became obsessed with this king...so he deticated his life researching and gathering power so he can bring him back once more. -This Cepter is made of a special and unknown wood that keeps itself smooth but at the top rest a stone thats glowing in many colors...this stone is called the Rainbowcrystal(its named that way because of its glow) and its the primary source of his abilities. Personality/Attitude: Ezekiel is a twisted and deranged person that dosent care for others except the 8 angels of death. he has lost sympathy for others or himself in that manner..his only true goal is reviving the king. -he creates two big snowflakes made of solid Ice that can cut through most things and shoots them towards the enemy. -He creates a Astragramm in his palm and charges toward the enemy to grab them and shock them immensily with electricity. -He presses his hands on the ground and creates spikes and cracks on the ground that can damage the enemy. - At the age of 17 he has lost his Parents in a housefire that was (accidentily) caused by his cousin Xina and therefore he became a orphan. But after that he was taken in by a man named Willam who was part of the Darkairan Royalguard and was trained by him to become his successor...but instead he became the Captain of the Royal guard at the age of 24. A blade forged from a special steel only found in Darkaira. The Red part of the Sword emmits a burning hot energy that can turn into literal flames when needed (Its all controled by Scanto). -He jumps high up in the air and falls back down on at the enemy with his swords crossed. -Mirrormagic is a rare and dangerous kind of Magic that lets the user create various mirrordouplicates and can even multiply a weapon to ten more weapons of the same kind. very experienced mirrormagicians have mastered the art of traveling between mirrors! Once a poor powerless boy who couldnt stand up for himself and now a funny madman who enjoys seeing people laugh but also brings fear into the heart of the enemies. He was taken in by a fallen Angel that liked his humor..so he brought him to the dark lord to work as a Jester....he was surprised that the king loved his humor and means of entertaining and so he became the jester of the dark king...now he is also the Jester of a Countess named Nebula. Talents/Skills: He is very acrobatic and with his weird body he can do some...crazy poses and tricks. He mastered mirrormagic which can duplicate himself and his spearattacks. Paired with his mirrormagic he can create illusions that can trick enemies and make them vurnable. -He creates a big mirror and sticks the spear into it and then over the enemy a big spear strikes down on them. Viktor and Susanne are married to eachother but do to a accident that was caused by Susannes powers that costed her her life. Viktor felt very guilty and panicked so what he did was looking though some of Susannes books about spells and magic... He found a spell that could revive her and ...IT DID! but not quite like he imagined... she transformed into a small and fragile shadowcreature instead of waking up from the dead... Viktor still feels guilty about it and developed depression because of this accident but he learned to live with Susanne being...well...tiny. They drove off far away from their homeplace and were basically homeless for a while but then they found a guesthouse in the woods near a small town. Physical Description: Viktor is a rather chubby man with dark rings under his eyes and a relaxed expression. Most Hated/Dislikes: He is strictly against bullying and will go out of his way to defend people who are bullied (like with Aiden). But what he truly hates is when someone makes fun of Susanne..the person will regret messing with Vik after that. 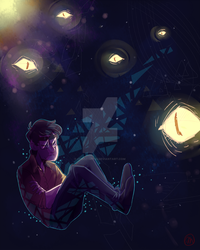 -This power allows him to controle, create and become Shadows but this is not all. He can create Shadow-arms that can grab/stab/tear apart everything they get a grip on. He can also travel between the Human/Dikara world and the Deep Scape(a place he Owns) and even hide in peoples shadows. But his most dangerous ability is turning into ,,The Shadowbeast´´ which his basicly a more animalistic and bigger version of him that is completly made of shadows...its very destructive and wields a big scythe. -This Power allows the user to manipulate or take other peoples souls. The Deepscape is a realm owned by the being named ,,Xavier´´ which basicly acts like a cage in a way. It keeps countless souls of people that Xavier took there but it also holds the Body of the Dark king in there as a means of protecting Darkaira. This place is almost like a wasteland. Physical Description: Xavier is a tall and menacing man with a white mask and fancy cloths. He moves and acts in a formal or calm way. Talents/Skills: Other than his abilities to controle/become shadows its quite unknown what he can do. -His own shadow forms into multiple Shadow-Arms that can either slither along the ground or even on walls and such...or they become real and attack like real arms would. Or they grab/wrap around the opponent like snakes. -His body turns pitch black and every attack goes through him like his is a ghost. -He creates a black space around him or at certain places and lets spikes grow out of them. Hi there! Thanks for the fave! I LOVE your works by the way! And the fact that it's all demons and stuuf, their just awesome! I am a total fan of demons, warriors, vampires, hunters, ghosts, and a whole lot more! Thanks again, and keep up the good work!! Oh eh well The pictures itself are not mine they were made FOR me but the characters are 100% mine! Oh okay...but they were amazing though. I like how creative the character works!